I wrote about Julie's Airport Cafe back in 2011 when she first opened. I've known Julie since she was a server at the Marine Inn and then Kane's here in Powell River. Julie had a dream of opening a restaurant of her own, and from the beginning it's been a success. The original name was Julie's Airport Market and Grill. There's no longer a market so Julie can focus on what she does best, make some of the best food in town. Wayne and I went for breakfast and were blown away at Julie's remodel. Wow! But I'm sure glad she kept the airplane theme. Julie's is open seven days a week for breakfast and lunch. You never know who you'll find at the next table, a neighbour, a local bigwig, or someone who just flew in to get some good eats. On a recent visit we discovered a unique "table." It's part art and also a place to sit and eat. It was created by O.C. "Dobie" Dobrostanski, the artist from Dogwood Studio on nearby Texada Island. The Warbird Tables created by Dobie Dobrostanski from Texada Island. The fuselage of the airplane is a wall mural, but the wing and tail are tables where customers can sit and enjoy breakfast or lunch. How cool is that? Hand painted giant saw blade and helicopter rotor blade over the door. The walls and ceiling of Julie's are covered with aviation pictures and aircraft models. Some of the many airplane models hanging from the ceiling. It's been so exciting to watch our Orchard Mason Bees using their nesting blocks, we decided to make them a second hotel. Nesting runs from mid-March through late Spring, so we had enough time for a few more bees to use the facilities. Step 1: Start with an old birdhouse. I started with an old birdhouse and went from there. Step 2: Remove the front wall and clean the inside thoroughly. Don't you love to save something and then find a new use for it? Step 3: Give the old birdhouse a facelift with new paint. 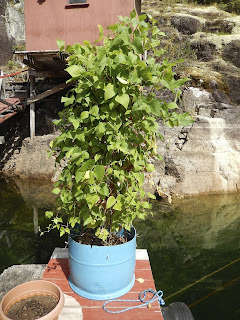 A container for the drilled nesting blocks protects them from rain. Step 4: Preserve the new paint and exposed surfaces with Acrylic spray. Click here to see how we drilled nesting blocks to put inside. Step 5: Mount the Bee Hotel on a south facing surface. Two matching birdhouses look nice together on our porch pillar. An Orchard Mason Bee heading into one of the holes at full speed. The bees move so fast it's hard to get closeup photographs. Another Orchard Mason Bee heading in from the lower left. Orchard Mason Bees lay eggs packed within pollen plugs that are sealed in a series in each hole. The eggs turn into larvae that live off the stored pollen and emerge eleven months later to start the cycle all over again. Up until this year we've been reluctant to use bird feeders at the cabin. We were afraid the birds would become dependent on them and that would make traveling away from home difficult. But this year we gave in and started using a seed feeder and a hummingbird feeder. The hummingbird feeder was such a success we now have two to keep up with the birds' feeding frenzies. 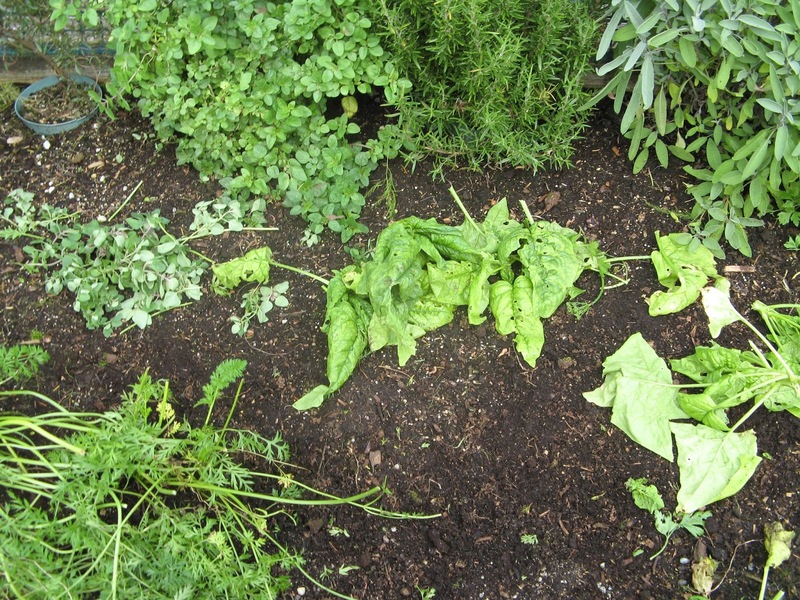 Click below to see them in action. Each year we have Tree Swallows and Violet-Green Swallows come to use our birdhouses for nest building. This year I decided to give them some alternatives to the grass and moss we see them carry in. I saved hair from my brush and cut yarn into short lengths. I separated the four-ply yarn lengths to make each section thinner and easier for the Swallows to fly with. I used a small mesh bag that I got my onion sets in. I put the jumbled up yarn and hair inside the bag and used tweezers to pull some partway out to tantalize the birds. Using tweezers to pull yarn and hair through the mesh for easy grabbing. I hung the bag from the railing on our bridge to shore. This spot is almost directly under the birdhouses on the shed wall. I haven't seen any action yet, but birdhouse selection and nest building is still a week or so away. The mesh bag of nest building material hanging from the bridge railing. 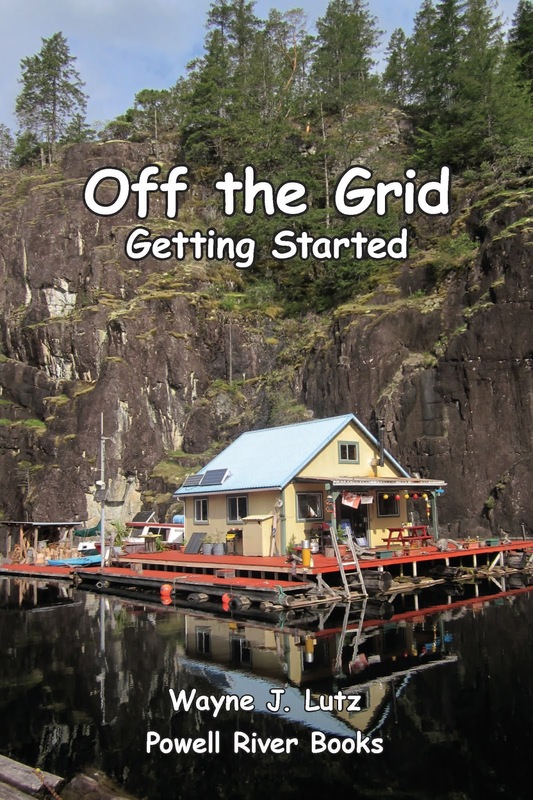 Wayne and I enjoy sharing about off-the-grid float cabin living on Powell Lake, here in Coastal BC. 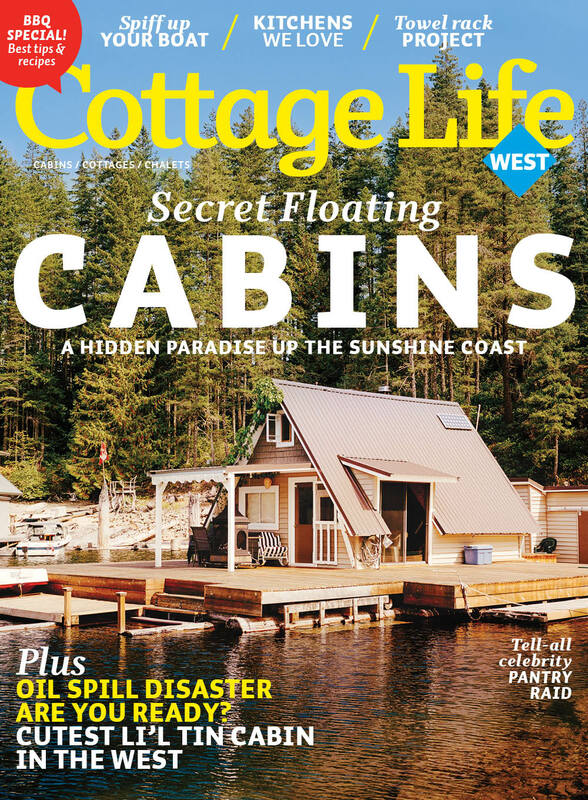 This month, we were included in an article about float cabins that was published in the May western edition of Cottage Life magazine. 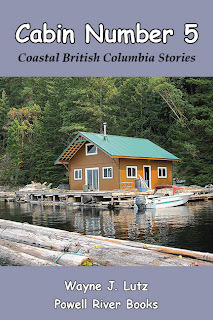 Jim Sutherland, the article's author, came to Powell Lake to meet our favourite real estate agent, Harry Zroback. 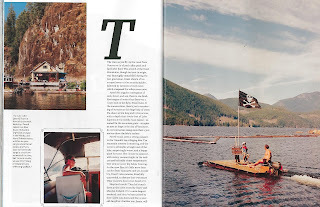 Harry was instrumental in helping us purchase our float cabin in 2001. 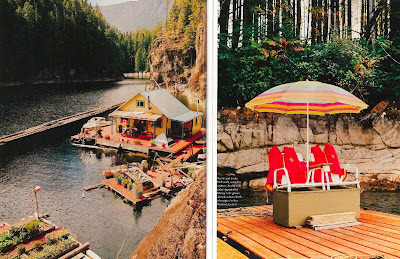 Our cabin on the first page of the Cottage Life article. 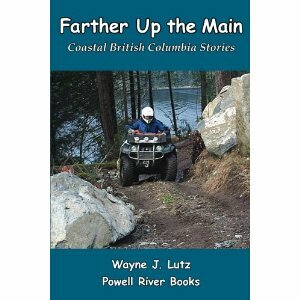 We were away on a barge quad trip to the head of Powell Lake when the author was scheduled to arrive. 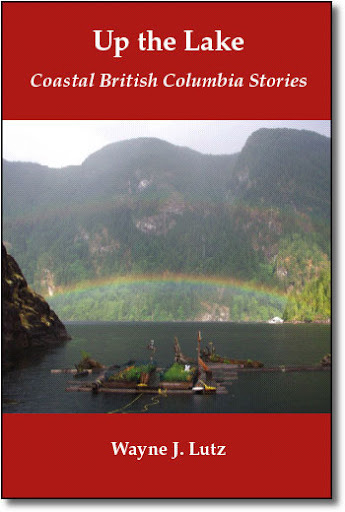 Harry still brought them by our cabin for photographs and I did a telephone interview after the fact. 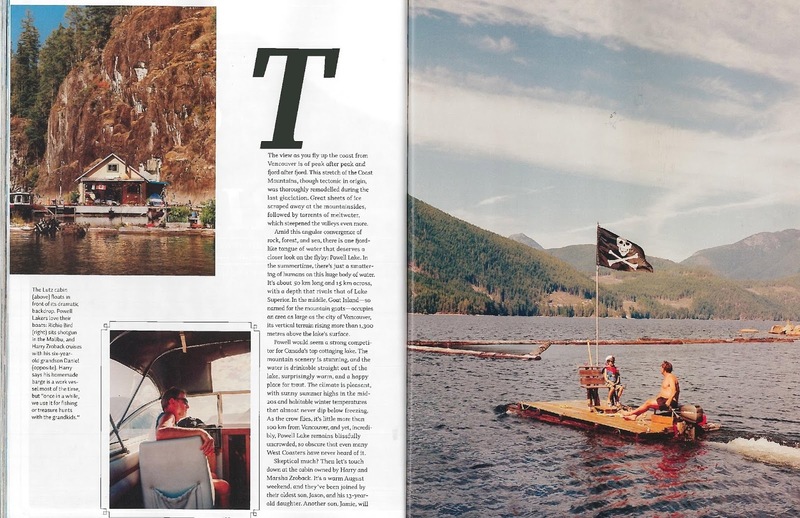 The article entitled "The Good-Time Drifters" included several cabins and their owners. 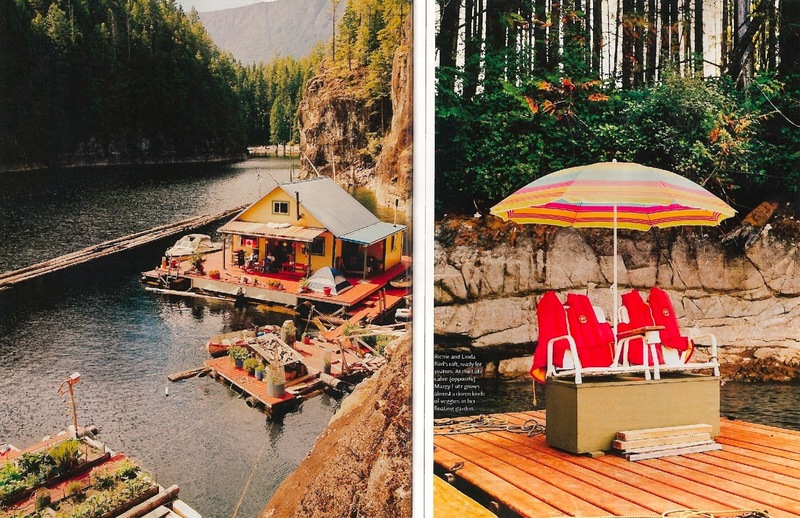 There were two nice shots of our cabin and a short story about us. On the left there's a full page picture of our cabin and garden from the cliff above. Powell Lake would almost escape the prying eyes of Google but for the blogs of one cottaging couple, Wayne and Margy Lutz. They have a place on the lake's west side ... near a spot called Hole in the Wall. The Lutzes are the exception to the rule that everyone here is a local. 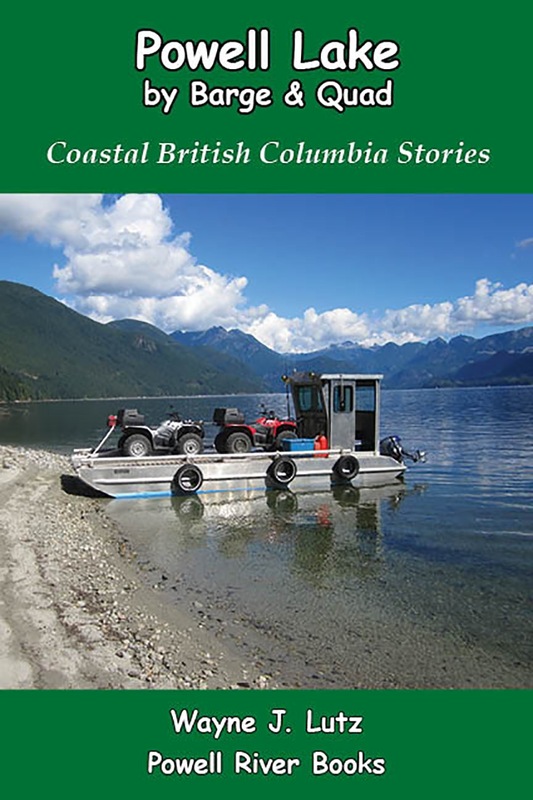 In 2000, they came upon Powell Lake after flying up in their plane from California. 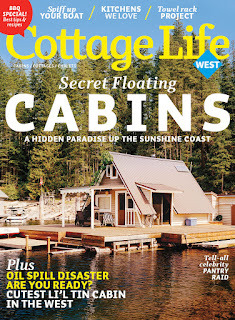 Maybe because they are on the lake for months at a time, maybe because they see themselves as homesteading ex-city folk than as weekending locals, their approach to float cabin dwelling is a little different.